I. Love. This. Dessert. I love it. I asked my mom to show me how to make it this weekend – and here it is! 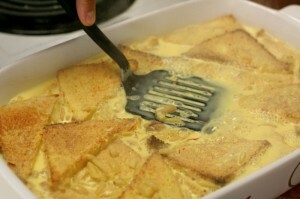 This is a Pakistani version of bread pudding made with sandwich bread instead of chunks of a more airy loaf. There are two keys to this dish: golden brown, crispy toast that soak up the sweet saffron-cardamom cream. The toasts are then served in a little pool of saffron cream, sprinkled with bright green pistachios. 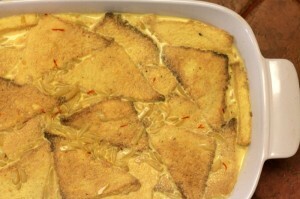 Shahi Tukray literally translated, means “Royal pieces.” Shahi comes from the Persian word Shah, king. When it’s used to describe something – food, a monument, some land – it designates that this is something of the Mughal era (or at least something hoping to be associated as such!) As it relates to food, Shahi foods are rich, made with a lot of sugar, cream, meat, and butter to evoke the wealth of the kings. 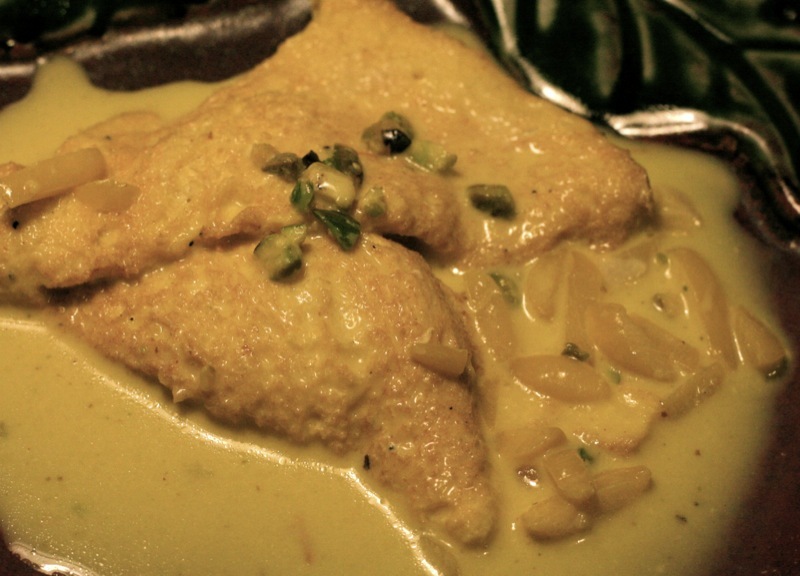 Examples: Shahi Haleem, a rich meat and lentil stew; Shahi Nehari, another rich and luscious meat stew, Shahi Pilau, a sweet-savory rice dish where rice is cooked in broth, then mixed with shredded carrots and plump raisins – sometimes a quarter to a half of it is removed and sweetened with sugar before being mixed back into the savory rice. Shahi Tukray are no exception to the norm of richness. I crispen the toasts under the broiler, but the old way was to fry each one in butter on both sides. There’s a lot of cream, butter, and zaafran (saffron – which isn’t as rare in Pakistan as it is here, because it’s farmed in Kashmir, but it’s not cheap, either). You can use more or less milk, depending on how much saffron cream you want with each serving. I like quite a bit, so I usually use more milk or cream than other people. Toast, in urdu, is called “Double Roti” – Double Bread. 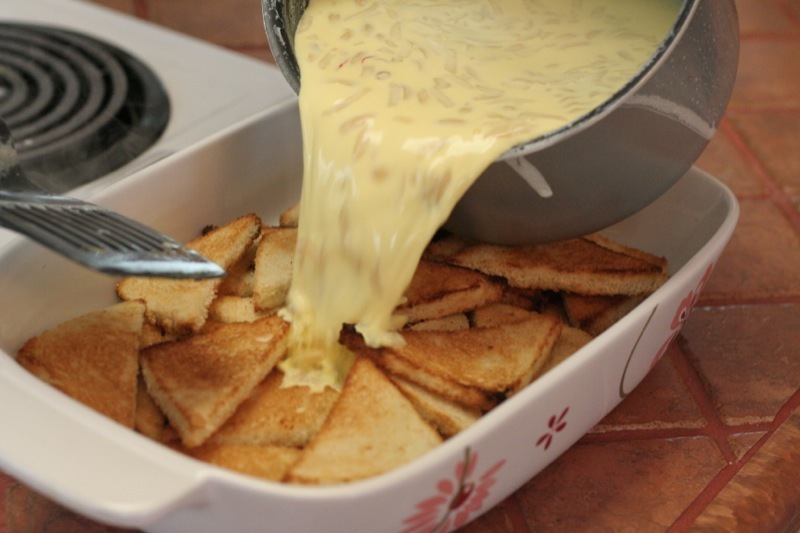 Thus, this dish is also known, colloquially, as “Double ka Meetha” – Toast dessert. Side note – Do you know why saffron is so expensive? Because saffron threads are actually the dried stigma of a very specific kind of crocus flower which is native to Southeast Asia. The stigmas have to be handpicked out, and each flower produces only three. If I was doing that, I’d make it the most expensive spice in the world too. 1. In a saucepan, heat the half and half, milk, and sugar, stirring constantly. When it starts to simmer, add the ground cardamom and keep stirring for a few minutes. 2. Let the mixture simmer well for a good 10 minutes, stirring as often as you can to prevent scorching. As my mom says, you need let the sugar cook and dissolve completely. Taste and add more sugar if you want – the cream mixture has to be pretty sweet, because it needs to be sweet enough for the toast as well. 3. Between 5 and 7 minutes into the simmer, add the saffron to the cream mixture and watch it turn that beautiful golden color. If you would like to put almonds into the dish instead of sprinkling them on top, put them into the milk here so they get a little softer. 4. Cut the crusts off of one whole loaf of sandwich bread. 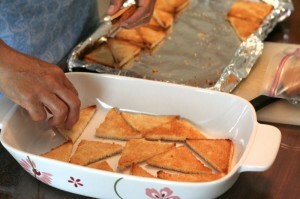 Cut the squares in half once to make two triangles. 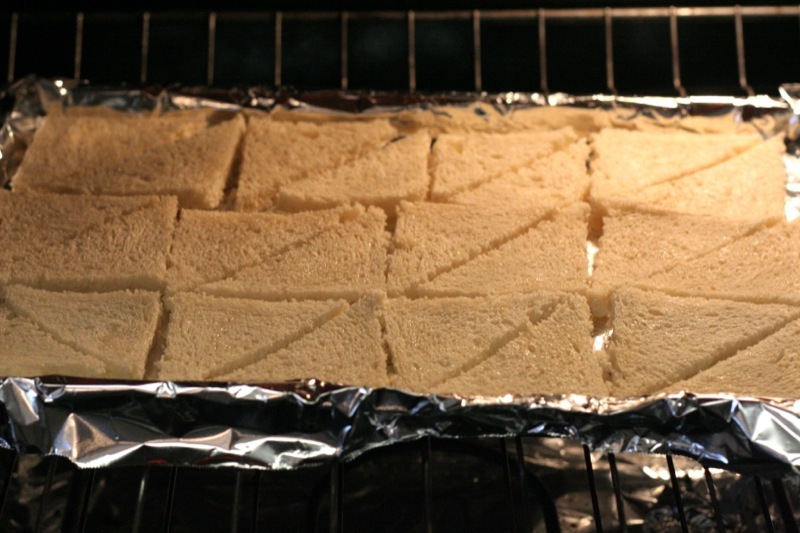 Put them on a cookie sheet in a single layer. Spray/brush with oil, butter or cooking spray and place under a low broiler until golden brown. Turn them over, spray, and toast again until golden brown. Let them cool for a few minutes to crispen up. 5. 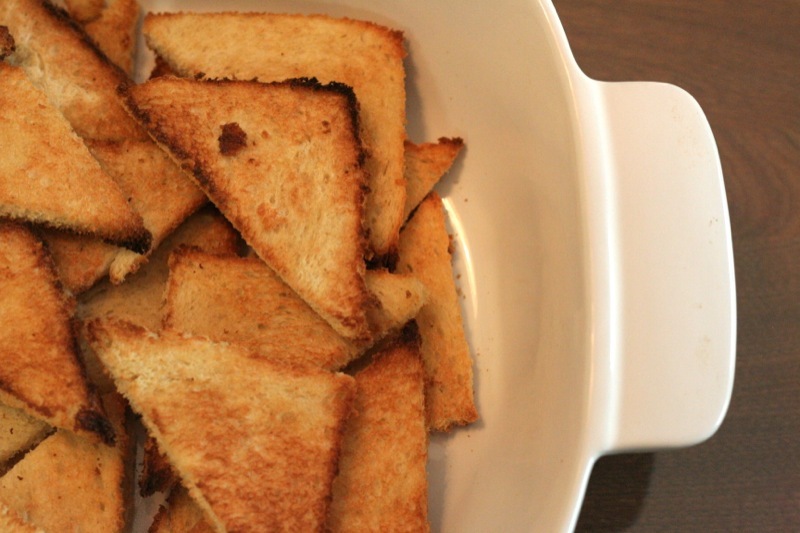 Arrange the crisped toasts in a 13×9 pan, layering them on top of each other. Pour the hot saffron cream on top and (this is important) use a spatula to push the toast down into the cream, holding it down for a few seconds in each area to make sure the toast absorbs the cream. 6. (This is also important) Lay a piece of plastic wrap on the toast so that the wrap is touching the surface of the cream/toast all over (this prevents a skin from forming). Let it cool on the counter for a little while, then refridgerate. This is delicious served warm or cold, but the latter is more traditional. I came across your blog while searching for veggie salan recipes, but I found a lot more I’d love to try. Including shahi tukras. it looks quite tempting inshallah I’ll be trying it soon, and give my feed back. hope to see more from you. My mouth is watering, I LOVE these! I first tried this from a friend also from Pakistan. I loved it! We also had for breakfast the next day. I didn’t get a chance to get the recipe from her, but yours looks just like hers. Thanks for doing this!